Gold mining involves the science, technology, and business of the discovery of gold, in addition to its removal and sale in the marketplace. Gold may be found in many places, most commonly rock but even sea water; in very small quantities. More often it is found in greater quantities in veins associated with igneous rocks, rocks created by heat such as quartzite. Mining for gold is only worthwhile financially where there is a significant concentration of it found in ore. The fixed price of gold in 1934 increased from $20.67 U.S. to $35 U.S. per troy ounce. This price remained fixed until 1968 which discouraged hard rock mining for gold because increased inflation (which raised the cost of mining production) prevented the mining companies from making a profit. Before hard rock mining operations have even begun, companies explore areas where gold may be found and scientifically analyse the rock. The actual gold originates deep within the earth in places called pockets. These pockets are filled with gold, heavy ore, and quartz. If enough gold is discovered in the ore, the technological process of hard rock mining begins. First, miners dig a tunnel into the solid rock. During the 1930s, miners working for the companies dug these tunnels by hand, a very labour-intensive undertaking. Miners often risked their health, digging with picks and shovels during long shifts in these dark, damp tunnels, building the shafts and carting out the ore. 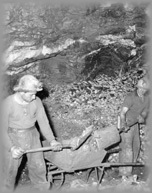 Most injuries underground involved falling rock, slips, and explosions, but the workers also had to inhale dust into their lungs in this era before safety regulations, safety equipment, and improved ventilation. The miners were willing to take the risks in order to provide for their families. After secondary washing, a shaker screen filters out fragments of less than 1/2 inch diameter into a fine ore bin, or box. Larger ore fragments are pulverized or crushed in the crusher. The fine ore is fed by conveyer belt to a ball mill, a rotating steel cylinder filled with tumbling steel balls which further crushes the fragments to a consistency of fine sand or talcum powder. This powder is fed into a thickener with a cyanide and water solution to create a sludge (a sticky, mud-like material). The liquid sludge is diverted into holding tanks and referred to as the pregnant solution - a liquid sludge containing 70 percent of the gold. This is drawn from holding tanks through a clarifier, a device that removes all the remaining rock or clay from a pregnant solution. In the next step, the material is taken to a de-areator tank that removes bubbles of air and further clarifies the solution. Zinc is added in dust form to the de-areated solution, which is drawn under pressure through a filter press which causes the gold and zinc to precipitate onto canvas (heavy cloth) filter leaves. This zinc-gold precipitate (condensed into a solid) is then cleaned from the filters while extreme heat burns off the zinc. Water passing through the filters is chemically tested for gold residue before being discharged into tailings ponds. Gold bearing water may be passed through the filtering process several times to remove all of the gold and separate it from impure substances. Gold recovered from the ore through the milling process is poured into bricks that are shipped to be assayed and sent to the Royal Canadian Mint in Ottawa, where coins are struck (made). The result of the milling process are three types of tailings rocks which cover the landscape of Wells. Hydraulic mine tailings are the resulting rocks washed down the mountainside with water monitors. Another type of tailings is taken out from the mountainside during tunneling. The rocks left over after being processed through a mill are referred to as mill tailings. Tailings have altered the shoreline around Jack of Clubs Lake and have the appearance of pale yellow, layered mineral sands.